As you probably know, our kitchen is currently comprised of a fridge and a toaster oven in the corner of our living room. We've collected some other kitchen components along the way (a Viking rangetop, some cool industrial pendant lights, etc.) for when our real kitchen takes shape. 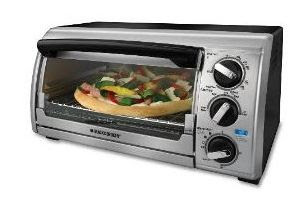 But for now, our trusty Black & Decker toaster oven keeps us from going hungry. For that reason, the kind folks at CSN Stores are giving away one of these sleek and trusty toasting machines to one of my lucky readers! Trust me when I say that this might be one of the most useful blog giveaways of all time. This is kind of an extra special giveaway too, because it's like winning your own version of the Thirtyeight20 kitchen! How glamorous! Leave a comment with your first name, and (optional) tell me about the funniest or oddest thing you've eaten in desperation when your cupboards were bare. Get a second entry by becoming a new follower. (Click the "Follow" button at right.) If you're already a follower, you can enter a second time as well because you're awesome. Get a third entry by posting about this giveaway on your own blog or Facebook, and then telling me about it. The deadline for entry is 8:00am EST on Monday, June 21st. My goal is, ummm, 1.2 million entries (which is pretty lofty...) so please be sure to tell your friends so they can enter too. I will select the winner using Random.org, so be sure to check back next Monday to see who won! EDIT: You must have a US shipping address to win. The oddest thing I've eaten is a bag of airline peanuts that I randomly found in the bottom of my purse. i absolutely need a toaster oven for my apartment! hm, usually when I have bare cupboards I go with the cereal as dinner method. So nothing too odd there, just sad. I subscribe too. Love watching what you guys are doing! i recently found an opened sleeve of ritz crackers in the cupboard, without knowing/caring how old they were. (i had no recollection of opening them...) i put one in my mouth, and it immediately disintegrated - it literally turned into sawdust. gross. Cereal with water. It's not so good. Sara - The oddest thing I ate out of desperation? Instead of using my usual salsa, I used Tapatio on a frozen burrito! I didn't realize it was SO hot!!! I gave it to my Dad! Sara - I am already a follower! LINDSEY enter me ;) Enter me 800 times because of how much you love me. A free toaster oven? Sweet! Oh, this is the best giveaway ever!!!! !Thanks for the chance to win!! Mayo and sweet pickle sandwich. Cool idea!! Just like you!! I'm also a follower! I'm crossing my fingers for this toaster! Michelle S. nutella right out of the jar!! What could be better! Hi! The oddest thing I've eaten when the cupboard was bare is vanilla ice cream with seasoned croutons! Yep, pretty gross! I have a perfect place chosen for the beautiful Black n Decker Toaster Oven! My fingers are crossed!!! Lacy - Miracle Whip and lettuce sandwich...that's my go-to when there's nothing else. It's really tasty actually! Cool! I hope I win :) Is this your first giveaway? I was really hungry for cereal one time about 4 yrs ago but didn't have any. So I remembered your 5th grade "commercial" and ate a bowl of animal crackers with milk on them...you my friend were a genious even back then! ...annnd I however am not seeing how i spelled genius wrong!! Btw just became a follower!! In college, my roommates and I would fry ramen noodles... sooooo yummy! Remember as a child sitting down with Dad and eating white bread, bananas and sugar doused with milk. He called it "soppy"-- that's how it was pronounced, not sure of actual spelling. Said it was something he ate in the army. Hey Emily! It looks like you guys are really making some progress over there! Great job!! Not sure if you realized I moved from Made2cREate to karapaslaydesigns.blogspot.com Would you mind changing the link on your sidebar? Thanks! Hope I win the giveaway!